Among the twinkling lights, garland, and over-eager shoppers, leather is filling up the shops this Christmas season. We see loads of leather pants, skirts, dresses, and jackets each winter, but this year, an abundance of t-shirt and turtleneck designs have been added to the mix. 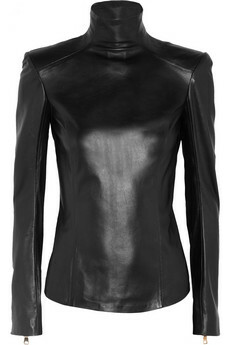 Net-a-porter.com has a variety of leather apparel to choose from. 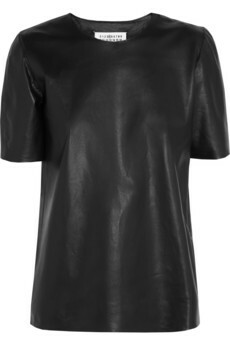 Some of my favorites include this t-shirt by Maison Martin Margiela ($1,690) and turtleneck by Balmain ($2,690.10). I also adore this high-waisted skirt by Haider Ackermann ($2,362) and cut-out dress by Valentino ($4,900). Absolutely stunning! I searched everywhere to purchase real leather, but had to settle for faux (PETA would be happy). I bought leather-friendly needles for my sewing machine and made a skirt. Then I designed and sewed an asymmetrical top to go with it and added leather behind the high-collar for stiffness to keep it upright. I bought enough of the faux leather (at the whopping price of $4 a yard) to also make my little boy an Anakin Skywalker costume for Halloween and either a dress or pair of pants for myself in the future. Quite a bargain compared to the extravagant leather designs seen on the runway.